“As early as 1915 and 1916, various Board Governors had urged banks to discount from the Federal Reserve and extend credit, and Comptroller John Skelton Williams urged farmers to borrow and hold their crops for a higher price. This policy was continued in full force after the war. The inflation of the 1920s began, in fact, with an announcement by the Federal Reserve Board (FRB) in July, 1921, that it would extend further credits for harvesting and marketing in whatever amounts were legitimately required. And, beginning in 1921, Secretary of Treasury Andrew Mellon was privately urging the Fed that business be stimulated, and discount rates reduced; the records indicate that his advice was heeded to the full.” (Rothbard 2008: 121). Rothbard refers here to Federal Reserve discount rate policy. At the beginning of 1921 the discount rates of the Federal Reserve banks were either 6% or 7% (data in Discount Rates of the Federal Reserve Banks 1914–1921, 1922). In May, a number of regional Federal Reserve banks began lowering discount rates from 7% to 6.5%. Then in July a number of rates were cut from 6% to 5.5%, and to 4.5% to 5% by the end of the year. The recovery from the recession is usually dated to July 1921, so that first discount rate cuts did indeed precede the recovery. The libertarians claim that these rate cuts did not necessarily create loose monetary policy or easy money, but most probably the rate cuts beginning in May 1921 had a great influence on the economy by way of expectations and business confidence: first, by signalling that the punishingly high discount rate policy had come to an end, and secondly by helping to create confidence and expectations of continuing rate cuts and looser monetary policy in the future, as indeed did happen. “Member bank reserves increased during the 1920s largely in three great surges—one in 1922, one in 1924, and the third in the latter half of 1927. In each of these surges, Federal Reserve purchases of government securities played a leading role. ‘Open-market’ purchases and sales of government securities only emerged as a crucial factor in Federal Reserve monetary control during the 1920s. The process began when the Federal Reserve tripled its stock of government securities from November, 1921, to June, 1922 (its holdings totaling $193 million at the end of October, and $603 million at the end of the following May). It did so not to make money easier and inflate the money supply, these relationships being little understood at the time, but simply in order to add to Federal Reserve earnings. The inflationary result of these purchases came as an unexpected consequence. It was a lesson that was appreciatively learned and used from then on. If the Reserve authorities had been innocent of the consequences of their inflationary polity in 1922, they were not innocent of intent. For there is every evidence that the inflationary result was most welcome to the Federal Reserve. Inflation seemed justified as a means of promoting recovery from the 1920–1921 slump, to increase production and relieve unemployment. Governor Adolph Miller, of the Federal Reserve Board, who staunchly opposed the later inflationary policies, defended the 1922 inflation in Congressional hearings. Typical of Federal Reserve opinion at this time was the subsequent apologia of Professor Reed, who complacently wrote that bank credit ‘was being productively employed and that goods were being prepared for the consumer at least as rapidly as his money income was expanding.’” (Rothbard 2008: 133–134). Yet the modern libertarian spin on the recovery of 1921 is now that the monetary policy had no significant role in inducing a recovery. How times change. Discount Rates of the Federal Reserve Banks 1914–1921, Government Printing Office, 1922. Rothbard, Murray Newton. 2008. America’s Great Depression (5th edn.). Ludwig von Mises Institute, Auburn, Ala.
Richard A. Werner, “Can Banks individually create Money out of Nothing? — The Theories and the Empirical Evidence,” International Review of Financial Analysis 36 (2014): 1–19. I do not mean to be snide or devalue this paper, which I suppose must be seen as a sign of progress in mainstream economics, but surely many economists and historians who have paid attention to the nature and history of modern banking already know that the empirical evidence demonstrates that banks create money out of nothing. I also feel that plenty of economists with a “fractional reserve theory of banking” also recognise that banks create money from nothing too and are therefore also advocates of the “credit creation theory” of banking. Despite that, this is an excellent paper, especially its comments on the need for better financial regulation and the inadequacy of the Basel regulations (Werner 2014: 2, 17–18). Werner provides a really useful literature review of the supporters of the “credit creation theory” of banking and their writings (Werner 2014: 2–6). He lists Knut Wicksell, Henry Dunning Macleod, Hartley Withers, Schumpeter, Robert H. Howe, Ralph Hawtrey, Albert L. Hahn, and Keynes (at least in the Tract on Monetary Reform ) as leading advocates of the “credit creation”/endogenous money theory of banking, and how this view even seemed to be widespread by the 1920s (Werner 2014: 6). Werner also notes how the correct “credit creation theory” was displaced from the 1930s–1960s by advocates of a “fractional reserve theory of banking” that denied that individual banks can create money, even if the banking system in the aggregate does (Werner 2014: 7). Paradoxically, Keynes by the time of the Treatise on Money seems to have endorsed the “fractional reserve theory” and, worse still, in the General Theory the financial intermediation theory (Werner 2014: 7, 9), a point which was noted with dismay by Schumpeter (Werner 2014: 9). One of the most interesting aspects of Werner’ paper is how Keynes’ regression to the “financial intermediation” theory of banking in the General Theory had a terribly bad influence on neoclassical synthesis Keynesianism and modern mainstream neoclassical economics, which owing in part to Keynes and the work of James Tobin and others has reverted to the “financial intermediation” theory (Werner 2014: 9–10). This has been a stark and embarrassing regression in knowledge by mainstream economics, and Werner is absolutely right to complain that “since the 1930s, economists have moved further and further away from the truth, instead of coming closer to it” (Werner 2014: 16). But, strangely, on p. 11 of the article Werner seems to be saying that “Post-Keynesians” also endorse the “financial intermediation” theory of banking (Werner 2014: 11), which is a most bizarre error. The important empirical evidence that Werner provides was his personal borrowing of €200,000 from the Raiffeisenbank Wildenberg e.G. bank (in a town of Lower Bavaria) in August 2013, and the bank’s disclosure of how this occurred in accordance with its standard internal credit procedure, accounting practices, balance sheet and IT procedure (Werner 2014: 13–14). The bank did not borrow extra reserves or obtain new “deposits” before it made the loan, and its reserves remained fixed at €350,000 both immediately before and after the loan transaction (Werner 2014: 14). The daily account statements of the bank, obtained by Werner, demonstrate that its accounting activities and balance sheet contradict both the “fractional reserve theory of banking” and “financial intermediation” theory (Werner 2014: 14–15). “Thus it can now be said with confidence for the first time – possibly in the 5000 years’ history of banking – that it has been empirically demonstrated that each individual bank creates credit and money out of nothing, when it extends what is called a ‘bank loan’. The bank does not loan any existing money, but instead creates new money. The money supply is created as ‘fairy dust’ produced by the banks out of thin air.” (Werner 2014: 16). I suppose Post Keynesians should be very pleased indeed with this conclusion, but will be dismayed by the (as far as I can see) total lack in Werner’s article of any reference to their work on banking and endogenous money which already reached this conclusion decades ago. One final point can be made about Keynes: most probably Werner is right that Keynes’ exogenous money approach in the General Theory of Employment, Interest, and Money (1936) has had a pernicious effect on the modern theory of banking, but, as far as I know, Keynes reverted to the endogenous money theory in his article “Alternative Theories of the Rate of Interest” (1937: 247, 248), where he stressed the finance motive as a basis of endogenous money. Perhaps the trouble is also that many economists have not bothered to read what Keynes wrote after the General Theory. Werner, Richard A. 2014. “Can Banks individually create Money out of Nothing? — The Theories and the Empirical Evidence,” International Review of Financial Analysis 36: 1–19. If we define “fact” as a synthetic a posteriori proposition, then it would appear that nearly all facts are to some extent “theory-laden,”* but that does not vindicate apriorism or Kant’s synthetic a priori knowledge, nor does it discredit the moderate form of empiricism that is rightly at the heart of modern methodology and epistemology in the natural and social sciences. When we interpret some data or fact in the natural and social sciences ordinarily we will clearly pre-suppose a number of theories when we make interpretations of the facts. But the standard theories we presuppose in either the natural sciences and social sciences have already been justified empirically, by experience, inductive argument and inference to the best explanation (which is just another non-deductive, or inductive form of reasoning) by long debates and arguments in philosophy or in the natural and social sciences too. (7) the human mind is the product of the physical activity of the brain, and so on. Theories (1) to (3) belong to the philosophical sub-disciplines we call ontology and epistemology. The theory that other human minds really exist and that an external world exists can only be justified empirically by inductive argument by analogy and inference to the best explanation. There are no a priori or deductive arguments that can establish the necessary truth of these ideas. In fact, you cannot prove they are necessarily true at all: they are synthetic a posteriori propositions whose truth is extremely probable at best, and we know this only by experience, induction or inference to the best explanation. Exactly the same thing can be said of propositions (4) to (7): these are empirical propositions of the natural sciences that are synthetic a posteriori: their truth is extremely probable at best and is confirmed by experience, induction or inference to the best explanation. We could continue listing “prior” theories that a social scientist like an economist assumes when interpreting some data or facts, but we would also find that these too are nothing but empirical propositions whose truth can be believed because we have good empirical evidence to do so. We will also encounter useful concepts that are formulated to categorise and classify objects and phenomena in the world which are analytic a priori (or true by definition because we define them in such-and-such a way). While this does presuppose a further type of “theory” when looking at data or facts, the ultimate test of whether a system of analytic classifications and definitions is useful and appropriate is how well it can classify and describe the world, so the actual justification for its use is not divorced from empiricism. At some point of course we will start to encounter bad and false empirical theories or assumptions in some disciplines, such as in neoclassical economics. But even here the only way to know if a theory about the real world is true or false is by experience, induction or inference to the best explanation. You are not going to do it by armchair apriorism. So what is the substantive point here? Mises claimed that the German Historical School and the logical positivist empiricists of his time thought that they could take facts without recourse to any theory. Perhaps they did. They were wrong, and modern empiricism has since moved on. And clearly heterodox economists of the non-neoclassical Institutionalist and Post Keynesian schools seem to accept that facts are theory-laden too (e.g., see Hodgson 1999: 146; Lawson 1997: 295). But the lazy comment that all facts are “theory-laden” is still used by apriorists like Austrian economists to attack modern empiricism in their attempts to vindicate the intellectually bankrupt method called Mises’ praxeology. It is an absurd exercise in vain, for the admission that “all facts are theory-laden” does not vindicate epistemological apriorism in either the natural or social sciences and not in economics either, and does not refute a more moderate version of empiricism that accepts that we do indeed have many prior theories but that they are also justified empirically. The “all facts are theory-laden” mantra does not discredit the modern empirical method. Nor does it refute the observation that we have no good reason to think that all of our knowledge of the real world is anything but empirical and justified empirically: we have no good reason to think epistemological apriorism is a viable or necessary method in our study of the world in all of its complexity, from the natural world to the complex world of human societies. Any given datum or fact may indeed presuppose a long list of prior theories or propositions. But we will find that these theories or propositions are themselves also empirical and have been justified too by some other social or natural scientist or philosopher who asked the question “how do we know such-and-such is true” and justified its truth convincingly a posteriori by experience, induction or inference to the best explanation. * The only possible exception I can think of is Descartes’s cogito ergo sum (or cogito) argument, but on closer inspection probably many would argue that it is not free from a prior theory/assumption that there is an “I” that must be understood as a discrete conscious entity and perceiving subject that perceives objects of perception. On a related point if the cogito argument is reformulated to conclude that some perceptions, sensations or thinking exist or are occurring, then it might possibly be considered an ontologically and epistemologically necessary a posteriori truth (but there are also arguments against this), and even if it were it takes you nowhere epistemologically: it is a dead end and cannot be used as a secure foundation for apriorism, nor to deduce any necessary truth in the natural and social sciences. Hodgson, Geoffrey M. 1999. Economics and Utopia: Why the Learning Economy is not the End of History. Routledge, London and New York. Jesús Huerta de Soto, 2014. “Deflating the Inflation Myth,” Cobden Centre, 7 December. “[Interviewer:] Does that mean we should be happy about deflation? Really? The deflationary period of the 19th century generated “the greatest increase in prosperity in history”? What is the evidence for that? Now it is true that there was in virtually all nations a long-run deflationary trend for most of the 19th century, even if punctuated by inflationary booms outside the 1873 to 1896 period (which was marked by almost persistent deflation). Huerta de Soto’s statement can only mean that the gold standard era had an historically unprecedented real per capita GDP growth rate compared to all other eras both before and since. This is what happens when an Austrian economist puts his foot in his mouth and makes statements in accordance with Austrian ideology but not backed by the empirical evidence. As we can see, the industrial revolution of the 19th century under the gold standard most probably generated the greatest increase in real per capita wealth in history up to that time, but its record has since been surpassed. The best period of real per capita GDP growth was the 1950–1973 era: the time of Keynesian economics and modern macroeconomic management and also a much higher level of government intervention in the economy, both before and since. But, the critic might counter-argue, didn’t Huerta de Soto really mean it was that specific deflationary period of the 19th century – which is normally taken to be the 1873 to 1896 era – that generated “the greatest increase in prosperity in history”? Possibly that is what he meant. German Average per capita GDP Growth Rate 1873–1896: 1.495%. Since these were the most advanced, fastest growing economies of the late 19th century, it is unlikely any other nations achieved an average per capita GDP growth rate higher than them, and certainly not in numbers large enough to affect the average for that era. So even within the 1873 to 1896 era the figures do not seem to deviate too far from the 1820–1913 OECD average. They were also inferior to the Keynesian golden age of capitalism from 1950–1973, which remains the best period in human history for real per capita output growth. One can also note that the deflationary era of 1873 to 1896 produced deep business pessimism at the least in the UK (and possibly other nations too) resulting from the “profit deflation” or profit squeeze of that era, and there were also protracted economic problems in the 1870s and 1890s. In the US, this period coincided with the free silver movement and bimetallist political movement that opposed the gold standard, arising in part from the debt deflationary distress to debtors in that era. In short, the idea that under the gold standard the industrial nations “generated the greatest increase in prosperity in history” at any time before or since is untrue, and is nothing but a libertarian myth. Davidson, P. 1999. “Global Employment and Open Economy Macroeconomics,” in J. Deprez and J. T. Harvey (eds), Foundations of International Economics: Post Keynesian Perspectives, Routledge, London and New York. 9–34. In essence, Sharpe and Suarez conducted a survey of 550 corporate executives in nonfinancial industries directly asking them how their investment decisions are affected by a change in interest rates with other factors held constant in September 2012, and 541 responded (Sharpe and Suarez 2013: 3, 7–8). (2) “By how much would your borrowing costs have to increase to cause you to delay or stop investment projects?” (Sharpe and Suarez 2013: 3). (6) more than 3 percentage points (Sharpe and Suarez 2013: 3–4). “The vast majority of CFOs indicate that their investment plans are quite insensitive to potential decreases in their borrowing costs. Only 8% of firms would increase investment if borrowing costs declined 100 basis points, and an additional 8% would respond to a decrease of 100 to 200 basis points. 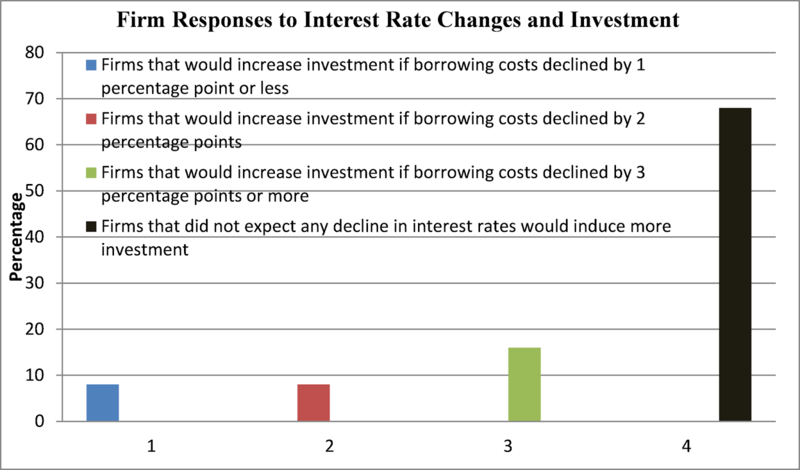 Strikingly, 68% did not expect any decline in interest rates would induce more investment. In addition, we find that firms expect to be somewhat more sensitive to an increase in interest rates. Still, only 16% of firms would reduce investment in response to a 100 basis point increase, and another 15% would respond to an increase of 100 to 200 basis points.” (Sharpe and Suarez 2013: 4). We can put this in graph form below. The findings are pretty stark: 68% of CFOs said that they would not expect “any decline in interest rates would induce more investment.” Of the firms in this category many were insensitive to interest rates changes because they finance investment out of retained or current earnings (Sharpe and Suarez 2013: 20). Curiously, some 139 respondents answered “not applicable” (Sharpe and Suarez 2013: 7–8). Presumably this was because such firms also finance investment through retained or current earnings or do not have easy access to credit anyway (Sharpe and Suarez 2013: 20). It would appear that many firms that invest via retained or current earnings or just do not have borrowing plans in a coming investment period are relatively unaffected by interest rate hikes – or at least the interest rate hike has to be pretty large to make them cut investment plans (Sharpe and Suarez 2013: 4). Overall, however, businesses are more sensitive to rate rises than rate reductions. “… firms that expected their investment plans to be unresponsive to any conceivable decrease (or increase) in borrowing cost were given the space to provide a reason, and most offered one. The most commonly cited reason for insensitivity was the firm’s ample cash reserves or cash flow. Two other popular reasons were: (i) interest rates are already low (absolutely, or compared to firm’s rate of return); and (ii) the firm’s investment was based largely on product demand or long-term plans rather than on current interest rates. Only about 10% of firms providing a reason for not responding to a decrease cited a lack of profitable opportunities, and only a handful offered high uncertainty as a reason” (Sharpe and Suarez 2013: 5). The fact that many firms make investment decisions “largely on product demand or long-term plans rather than on current interest rates” should cause no surprise. Crucially, one year after this survey the respondents were questioned again when longer-term interest rates happened to be 100 basis points higher, and the new answers confirmed that their behaviour had been in line with what they said earlier (Sharpe and Suarez 2013: 5, 23–24). There is of course one caveat about this survey: interest rates were very low in 2012 and low interest rates may have increased business insensitivity to interest rate changes (Sharpe and Suarez 2013: 20–21). While that is true, it is still quite likely that even this factor has not skewed the survey results so badly that the findings are not generalisable. In fact, the discovery that most businesses do not regard interest rate changes as a major factor determining investment was already a fundamental finding of the Oxford Economists’ Research Group (OERG) in the 1930s in their survey work: they found that uncertainty was an overriding factor in the investment decision, not interest rates (Lee 1998: 88). Other empirical evidence seems to corroborate this (see Caballero 1999). A final point can be made about interest rate rises. If interest rates are raised very sharply and severely (as in, say, the “Volcker Shock”), I do not think that anybody disputes that this is most likely to cause recession in a market economy. But mild to modest rate rises do not necessarily have to depress economic activity. Why? The reason is that many mark-up firms actually include interest payments as part of overhead costs, and many firms will raise their profit mark-up if interest rates are increased (Godley and Lavoie 2007: 265). If demand for a firm’s product is still strong, and a firm then faces an interest rate rise, it can simply raise its prices to recover the cost of higher interest payments. Caballero, Ricardo J. 1999. “Aggregate Investment,” in John B. Taylor and Michael Woodford (eds. ), Handbook of Macroeconomics (vol. 1B). Elsevier, Amsterdam. The evidence is very strong that British business people were complaining bitterly of a “profit deflation” by the 1880s during the deflation of 1873 to 1896. This was a major cause of depressed and pessimistic business expectations. But the crucial question arises: did this affect aggregate investment in this period? We can look at some data on UK gross domestic fixed capital formation in this era. 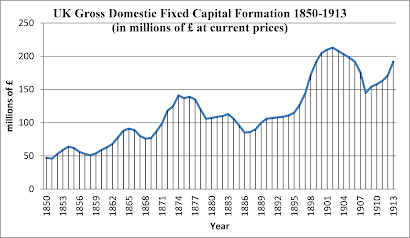 The following graph shows UK gross domestic fixed capital formation in millions of pounds at current prices from 1850 to 1913, so we can see the long-run trend (with data from Mitchell 1988: 831–833, National Accounts 5, which is based on Feinstein 1972). The trend of falling and stagnant investment after 1873 to the later 1880s is stark and leaps out of the data. Of course, this data is in current prices, and, given that factor costs must have fallen, is the data here misleading? Do constant, inflation-adjusted prices show a different trend? 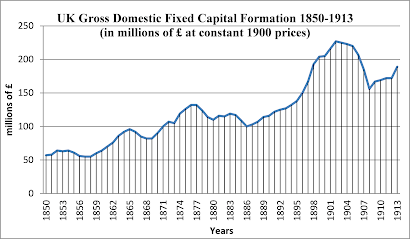 The next graph shows real UK gross domestic fixed capital formation in millions of pounds at constant 1900 prices from 1850 to 1913, so that, again, we can see the long-run trend (with data from Mitchell 1988: 837–839, National Accounts 6). Once again we see much the same trend, even if not so pronounced. 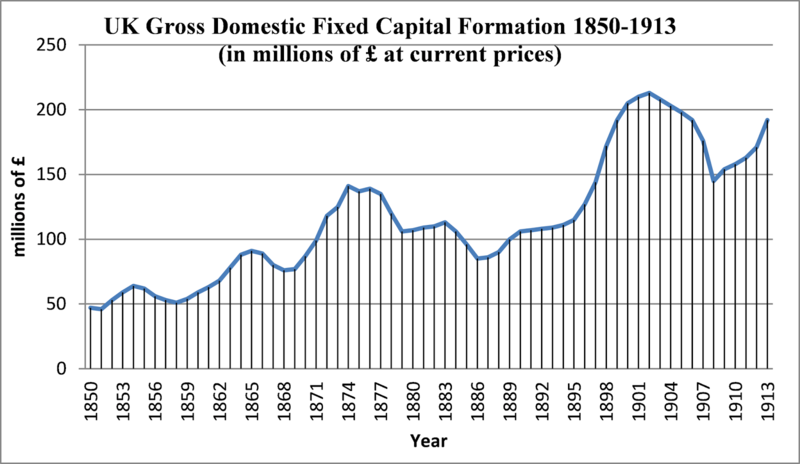 UK real gross domestic fixed capital formation began a sharp drop after the post-1873 deflation commenced, and even during the recoveries around 1880–1884 and 1886–1890 it grew only at a markedly low rate or even essentially stagnated. The mid-Victorian boom ended in the early 1870s, and (because of price deflation) real gross domestic fixed capital formation reached an inflation-adjusted value of £132 million in 1876, and then began a downward trend until the late 1880s. It did not attain the 1876 peak again until 1894. It is interesting to note that an inflationary spurt occurred between about 1888 and 1891 in UK wholesale and consumer prices (see the price data in Mitchell 1988: 728 and 738). 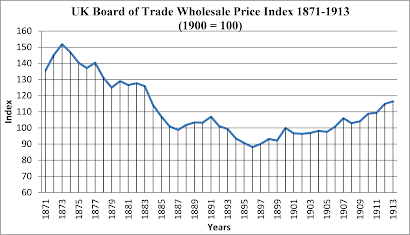 This can be seen in the graph below of UK wholesale prices from 1871-1913 from the Board of Trade index (with data from Mitchell 1988: 728). The brief return to inflation might have contributed to the beginnings of a long-run recovery in business confidence in the late 1880s. However, what recovery in investment that occurred looks weak and it was derailed by the deflationary recession of the 1890s. At any rate, the really strong recovery in investment happened after 1896 when the deflation ended and an inflationary boom developed until the outbreak of World War I. All in all, I would say that the evidence supports the view that the great deflation was not a period of a healthy, robust economy in Britain. As we have seen, contemporaries noted the phenomenon of “profit deflation” and loss of business confidence. Post Keynesians argue that the aggregate level of investment is strongly affected by business expectations and that such expectations are subjective, given the fundamental uncertainty that economic agents face. 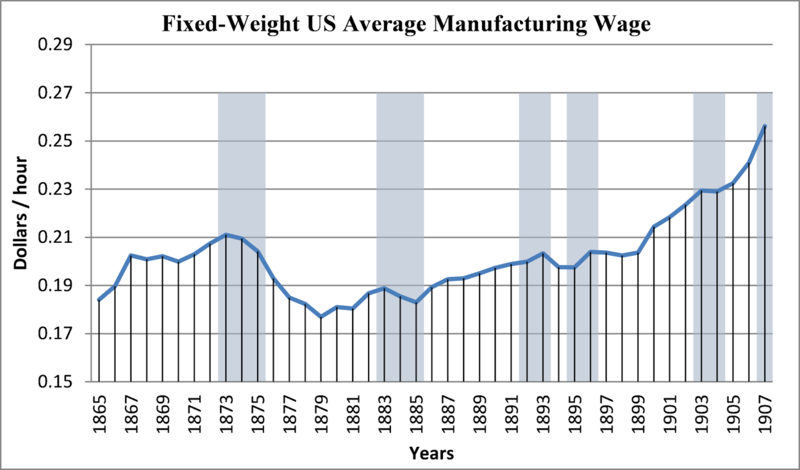 These insights can clearly be applied to the 1873–1896 era: price deflation with increasing downwards nominal wage rigidity caused a fall in profits by the 1880s. Though probably not the only reason, it was nevertheless one major cause of loss of business confidence that in turn caused business people to reduce the aggregate level of investment. Such a Post Keynesian view of the trend of falling investment in this era is the best explanation in my view. And it does not suggest that deflation is a benign and healthy phenomenon, despite what its advocates think. Feinstein, C. H. 1972. National Income, Expenditure and Output of the United Kingdom, 1855-1965. University Press, Cambridge. Mitchell, Brian R. 1988. British Historical Statistics. Cambridge University Press, Cambridge and New York. Marshall Auerback interviews Peter Temin here about the Great Depression, and about some other issues too, including the US recession/depression of 1837 and the gold standard. Peter Temin is of course a neoclassical Keynesian, and famous for his book Lessons from the Great Depression (MIT Press, Cambridge, Mass., 1989). Temin, Peter. 2013. The Roman Market Economy. Princeton University Press, Princeton, N.J.
Temin, Peter and Hans-Joachim Voth. 2013. Prometheus Shackled: Goldsmith Banks and England’s Financial Revolution after 1700. Oxford University Press, New York. 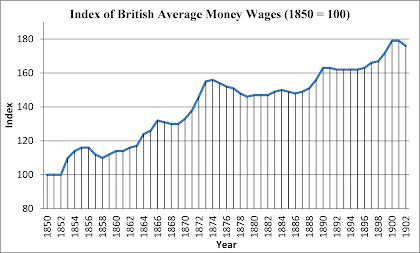 The graph below shows an index of average British money wages from 1850 to 1902, but in which the trend for the 1873 to 1896 era of price deflation can also be seen (with data from Wood 1909: 102–103). As we can see, despite the era of strong price deflation, nominal wages either stayed fairly stable or even rose, apart from the notable initial fall in the 1875 to 1879 period. 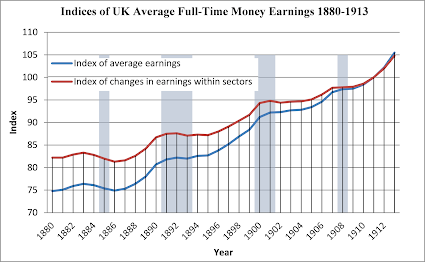 Even in the recessions of 1884–1885 and 1891–1893, money wages almost stayed level. With price deflation it is no wonder contemporary business people were complaining of a “profit deflation” by the late 1880s. Samuel B. Saul’s The Myth of the Great Depression, 1873–1896 (2nd edn. 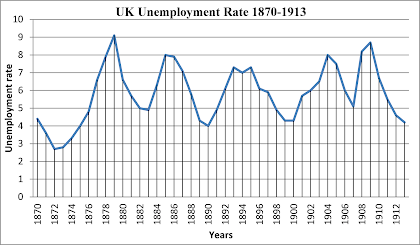 1985) analyses the 1873 to 1896 deflationary period from the perspective of Great Britain. Saul raises many questions in this book, such as the question whether we are justified in considering 1873–1896 as a unified period of economic importance, and what causes produced the general deflationary trend. Of course his major conclusion was that there was no actual continuous depression throughout the period, that real output at the end of the period was higher than at the beginning (Saul 1985: 54), and that the term “Great Depression” should not be used of the period (Saul 1985: 55). Furthermore, some of the trends visible in the 1873–1896 period continued afterwards and perhaps the downwards trend in prices was already underway in the 1860s and may, in some respects, have ended in the late 1880s (Saul 1985: 54). Overall the 1873–1896 period may not be a unified and historically significant era in the way previous economic historians thought (Saul 1985: 54–55). Nevertheless, Saul also found that there were economic problems within the period (Saul 1985: 54), and a careful reading of the book shows that it presents problems for the advocates of price deflation. I have summarised the main points and findings of Saul’s book below. First, are we justified in seeing 1873 to 1896 as a unitary period? 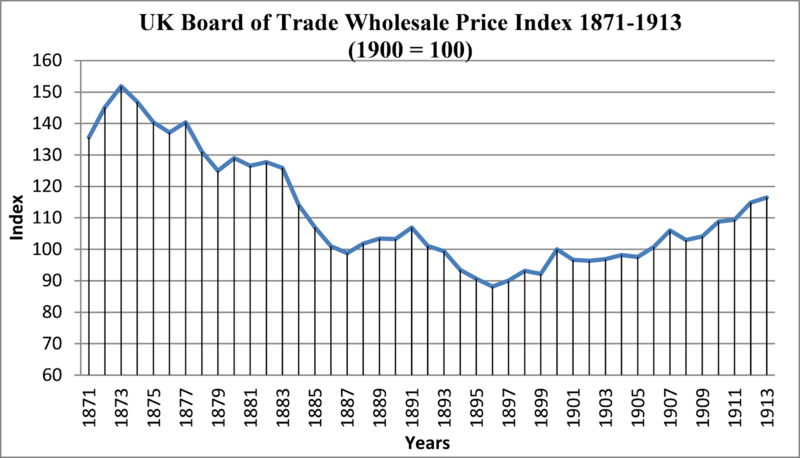 Landes (1965), for example, argued that the whole period from 1815 to 1897 was essentially a unified period displaying a long-run downward trend in prices, with a plateau in prices in the middle, driven by technological advances and positive supply-side factors (Saul 1985: 13). Nevertheless, to many historians and economists there is also something anomalous about the 1873 to 1896 deflation. Saul (1985: 15) raises the possibility that there was an overall major factor driving the deflation until the late 1880s, but thereafter perhaps no general overall factor driving it. In fact, this was the view of Keynes in the Treatise on Money (1931), and Keynes saw monetary factors as the general cause of the deflation until the late 1880s, and then a different explanation for the 1890 to 1896 deflation (Saul 1985: 17). (2) a quantity theory of money explanation, either through (i) the modern neoclassical quantity theory or (ii) one stemming from the quantity tradition in Classical Economics, where the cost of production of gold was assumed to also influence changes in its “price”. The second neoclassical quantity theory explanation has numerous supporters and certainly amongst monetarists, and it became popular by the 1980s (Saul 1985: 60). This explains the phenomenon as having been caused by the failure of the money supply to grow at a rate consistent with the growth in economic activity. The second explanation sees the deflation as caused mainly by price falls in many goods from technological factors, innovative production techniques driving down costs and positive supply side factors. For example, freight rates on shipping from America to Britain and to the Continent fell sharply in the 1880s (Saul 1985: 22), as did overland freight rates too (Saul 1985: 23). Many agricultural goods saw price falls as production in the Americas, Australia, New Zealand, and South-East Asia increased markedly and transport costs fell. In the end, Saul himself preferred an eclectic, not mono-causal, explanation of what caused the deflation that draws on many factors (Saul 1985: 26–28, 55). But what about the economic problems that resulted from the deflation? 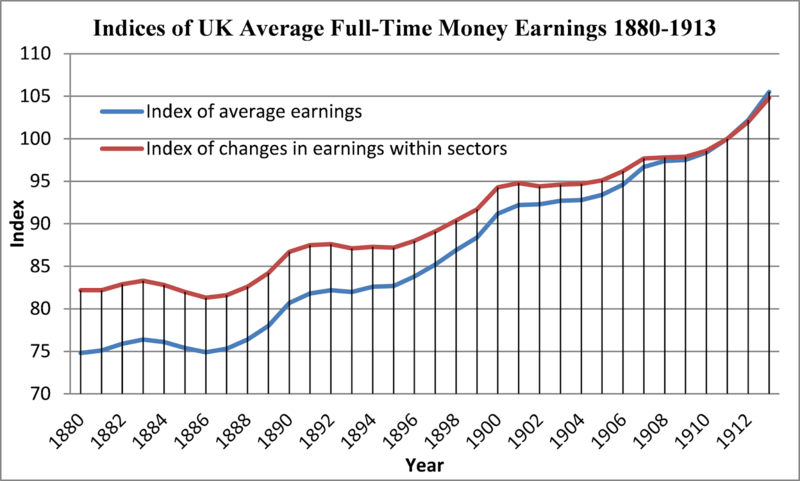 UK wages tell a very interesting story. 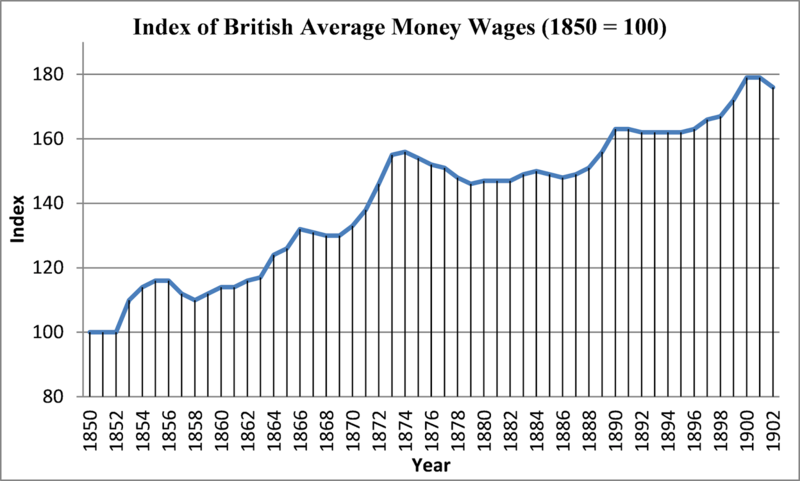 Money wages fell from 1874 to 1879, but thereafter, despite long-run price deflation, were either stable or actually rose (apart from a brief and small fall from 1884 to 1886) (Saul 1985: 31). 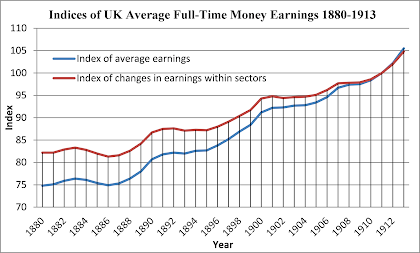 Real wages also rose virtually continuously from 1873 to 1896, apart from small falls from 1876–1878, 1879–1880, 1883–1884, and 1890–1892. It is clear that workers were able to maintain money wages even in the deflationary years and even during the recession of the early 1890s: in fact, in this period the share of income going to labour increased at the expense of profits (Saul 1985: 32–33, 63). This strongly confirms what contemporaries were saying: that the 1873–1896 period was marked by “proft deflation” or a profit squeeze that left business people highly pessimistic. While one cause of this for exporting industries is usually taken to be the slower growth of exports in the late 1880s (Saul 1985: 63), a fundamental cause must also have been price deflation and a significant degree of downwards nominal wage rigidity. There emerges a further crucial point from the “profit deflation” phenomenon of these years. 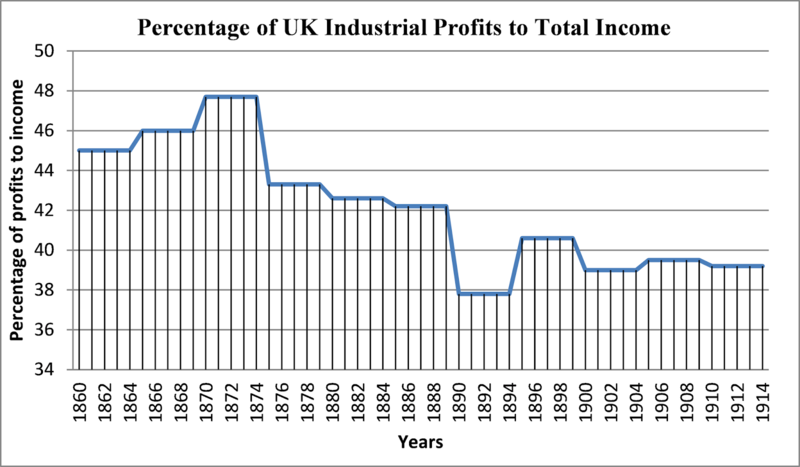 In Britain, it appears that a major source of business and industrial finance in the late 19th century was retained earnings out of profits (Saul 1985: 41). 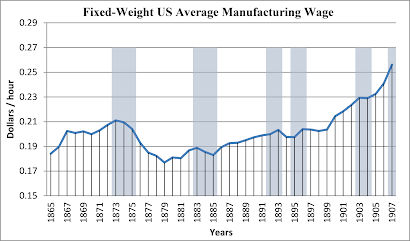 Saul adduces evidence that the share of profits out of industrial income fell as the deflation of 1873–1896 proceeded (Saul 1985: 42, citing Feinstein 1959), as can be seen in the following graph. 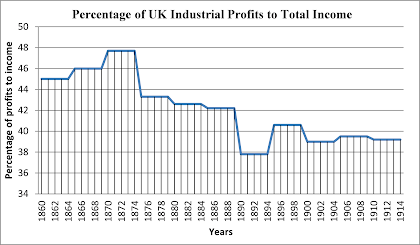 As we can see, the inflationary boom of the mid-Victorian age (1850–1873) saw rising levels of profits, but when the long-run deflation occurred, the percentage of profits of total industrial income fell significantly. It is possible too that what we would now call UK capacity utilisation rates fell in the late 19th century in this period (Saul 1985: 43, citing Ashworth 1966). 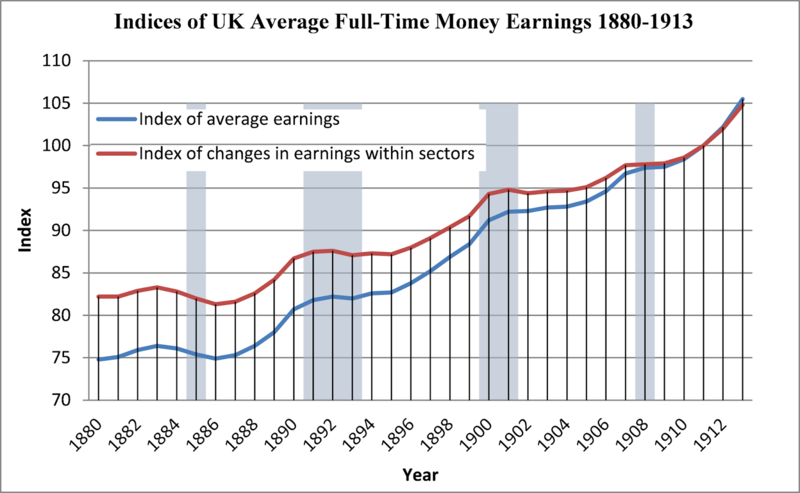 Saul blames institutional factors, the negative legacy of Britain’s “early start” in industrialisation, and the decline in Britain’s overseas export markets in the late 19th century for its failure to innovate and its lower levels of investment (Saul 1985: 51). But he also points to another important explanation: it can be argued that, given that UK investment was financed out of retained earnings to an important degree, the price deflation led to a falling profit rate given relatively inflexible wages so that this probably adversely affected aggregate investment and expectations (Saul 1985: 53–54). This actually stands out as one of Saul’s most important conclusions (Saul 1985: 53–54). So the effects of the “profit deflation” on business expectations were significantly negative, which probably caused increasing pessimism and unwillingness to invest. Saul, however, does not address the issue of debt deflation as a cause of business pessimism, but it may have been an important factor, and there seem to be hints from contemporaries like Alfred Marshall that it was a factor. 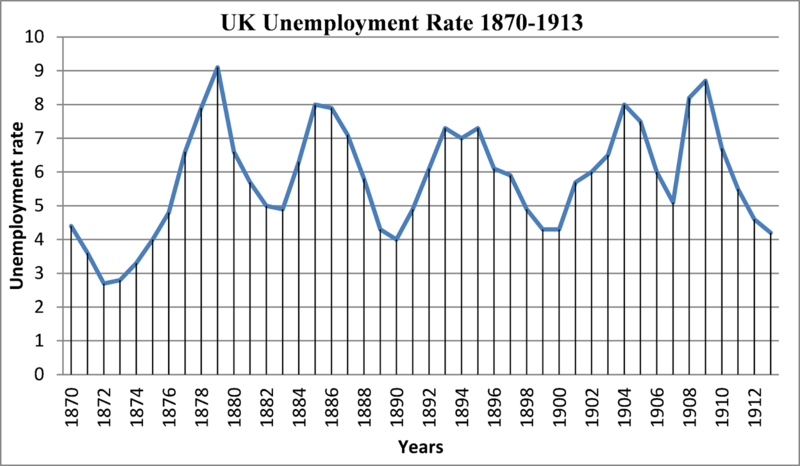 Finally, recent estimates of UK unemployment in the late 1800s show that significant unemployment did exist for much of this period, as can be seen in the graph below (with data from Boyer and Hatton 2002). Beckworth, David. 2007. “The Postbellum Deflation and its Lessons for Today,” The North American Journal of Economics and Finance 18.2: 195–214. Capie, F. H. and G. E. Wood, 1997. “Great Depression of 1873–1896,” in D. Glasner and T. F. Cooley (eds). Business Cycles and Depressions: An Encyclopedia. Garland Pub., New York. 287–288. Feinstein, Charles H. 1959. 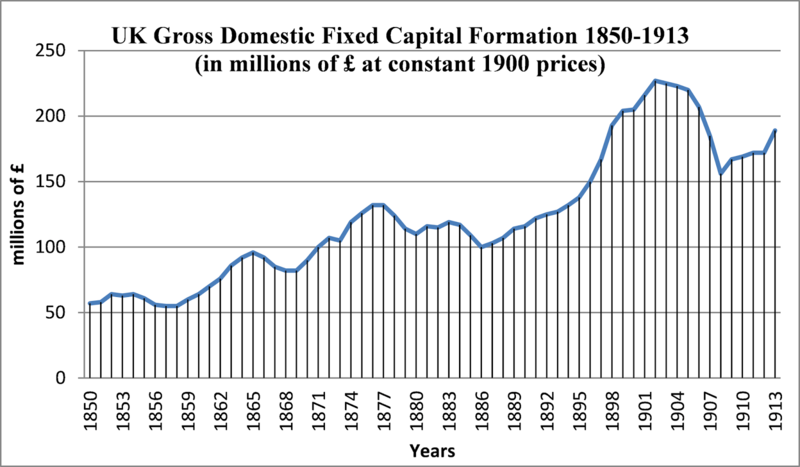 “Home and Foreign Investment: Some Aspects of Capital Formation, Finance and Income in the United Kingdom, 1870–1913,” Ph.D. dissert., University of Cambridge. Landes, D. S. 1965. “Technological Change and Development in Western Europe, 1750–1914,” in H. J. Habakkuk and M. Postan (eds.) The Cambridge Economic History of Europe (vol. 6). Cambridge University Press, Cambridge. 274–601. In 1885, Robert Giffen (1837–1910), the Scottish statistician and economist who from 1876 held a number of positions in the British Board of Trade, published an article on the ongoing price deflation that had begun in 1873 and its effects on UK business (Giffen 1885). “A third remark I have to make at the outset is that as trade depression may arise from very small changes in the total amount of production, while industrial organization is of such a nature that such changes need cause no surprise, it becomes equally no matter for surprise that changes in prices have so intimate a connection with the subject. The feeling of depression, judged by the realities of things, frequently appears to be either wholly unaccountable or to go far beyond what the facts warrant. And the explanation would seem to be that as there is a general rise of prices in prosperous times, and prices remain then at a high level, so in times of ‘depression,’ when production and consumption and saving are diminished by a small percentage as compared with what they are at other times, there is often a general fall of prices, and it is this fall of prices which produces much of the gloom. Merchants and capitalists are hit by it. At their stock-takings, with the same quantities of goods, or even with greater quantities, their nominal capital appears reduced. In falling markets their operations result steadily in loss for a considerable period. Many who have conducted operations with borrowed money are cleaned out, and fail. The community need be none the poorer. The goods themselves are not destroyed. Somebody gets the benefit of the lower prices. But the leaders of industrial enterprise, those who run the machine, are all poorer, and feel even poorer than they really are, as they are accustomed to look mainly at nominal values, and not at the quantities of the things themselves which they possess. The moral is that economists and public men should beware to some extent of the outcry from the market-place. Merchants and capitalists are not the whole community. Their interest in the long run is the same as that of all. No community can prosper steadily with its mercantile classes depressed. But the immediate interest of particular classes is often different from that of the community generally, and in this way it is not surprising that the gloom of the market-place in times of depression should appear altogether excessive in relation to the real circumstances of the community as a whole. Apart from exaggeration, which is also a factor to be reckoned with, the particular classes who cry out most from time to time about depression may suffer specially from evils which injuriously affect the community as a whole very little, or may even affect it momentarily for good.” (Giffen 1890: 5–6). “The most disastrous characteristic of the recent fall of prices has been the descent all round to a lower range than that of which there had been any previous experience. It is this peculiarity which more than anything else has aggravated the gloom of merchants and capitalists during the last few years. Fluctuations of prices they are used to. Merchants know that there is one range of prices in a time of buoyancy and inflation, and quite another range in times of discredit. By the customary oscillations the shrewder business people are enabled to make large profits. But during the last few years the shrewder as well as the less shrewd have been tried. Operations they ventured on when prices were falling to the customary low level have failed disastrously because of a further fall which is altogether without precedent. Similarly, landowners and other capitalists who are usually beyond the reach of fluctuations have had their margins invaded; rents, which rose so steadily for twenty years before 1873, have consequently fallen heavily; the change is more like a revolution in prices than anything which usually happens in an ordinary cycle of prosperity and depression in trade.” (Giffen 1890: 14–15). “This is another way of putting the fact that merchants and capitalists have lately encountered a descent of prices below the customary level, which has greatly put them out and involved them in fresh and most unexpected difficulties. The minimum of the former period has almost become the maximum of the new, and operations based on the former customary levels have failed.” (Giffen 1890: 17–18). Giffen, like other commentators at that time, was aware that there was something atypical and remarkable about the long-run deflationary trend from 1873, and that something like a price revolution was occurring. “The question then arises on these figures whether the depression at a time like the present may not be largely due to some permanent cause which has lately begun to operate; to which trade was not subject for many years after 1850, and which is now in full operation; and which has for its effect to prevent a rise of prices in good years to what was long considered the customary maximum, and to precipitate a fall in bad years to a point much below the customary minimum. That the answer must be in the affirmative appears to be very clear. There is no mystery at all about the actual course of prices, while the effect of the recent changes in diminishing the profits of capitalists, because the upward movement of prices is less than they expect, and the downward movement greater, is equally palpable. Merchants and capitalists all round have suffered. They have held stocks longer, or bought stocks sooner, than they would have done if they had not to some extent lost their bearings. Their gloom is great, because prices are obstinately low. Whatever may be the cause of so great a change, it is surely worth investigation. Two causes only have been suggested. One is a great multiplication of commodities and diminution of the cost of production due to the progress of invention, improved facilities of communication, lower freights, international telegraphy, and the like circumstances. The other is, that the precious metal used for standard money—viz., gold—has become relatively scarcer than it was, its production being diminished on the one hand, and the demands for it on the other hand increased. The former of these causes was discussed quite lately by Mr. Fowler, in the Contemporary Review, and a greater weight assigned to it than to the latter cause. I am disposed to give the greater weight to the latter. To a large extent, however, the two causes are not in conflict. The question is of money prices—the relation of money to commodities. Whether it is commodities that multiply, or gold that diminishes or does not multiply in proportion, the relation between gold and the mass of commodities is equally changed. It is quite conceivable that if gold were to increase in quantity, and its cost of production to diminish, as other commodities increase in quantity and have their cost of production diminished, there would be no change of any kind in gold prices. Commodities would be more abundant, but the abundance would make itself felt in a rise of money wages, salaries, rents, and profits, and not in lower prices. That it is felt in lower prices now appears to be absolute proof that the relation between gold and commodities has changed, that they have not increased in quantity and had their cost of production diminished pari passu. In addition, however, while not denying that there has been a change on the commodities side of the balance, I would go farther and maintain that what has happened to gold in the way of diminished production and increased demands upon it, arising from other causes than the multiplication of commodities, must have had great effect.” (Giffen 1890: 22–23). (2) a quantity theory of money explanation, though not quite a modern neoclassical one, but one stemming more from the quantity tradition in Classical Economics, where the cost of production of gold was assumed to also influence changes in its “price”. Giffen (1890: 24–25) noted that as gold production fell off after 1875, actual demand for gold rose as nations like Germany, the US and Italy went on the gold standard (or in the case of the US returned to it). The question of what the causes of the great deflation of 1873 to 1896 were remains a very interesting one, and we can see here how some economists at the time like Giffen explained it. To sum up, we can also see how, despite modern libertarian myths to the contrary, the great deflation of 1873 to 1896 caused a great deal of consternation and business pessimism at the time. This was described in the both the business press and academic writings of the late 19th century (e.g., see Marshall 1887; Wells 1887a, 1887b, 1887c, 1887d). Giffen, Robert. 1885. “Trade Depression and Low Prices,” The Contemporary Review 47 (June): 800–822. Giffen, Robert. 1890. Essays in Finance (3rd edn.). George Bell and Sons, London. Marshall, Alfred. 1887. “Remedies for Fluctuations of General Prices,” The Contemporary Review 51 (March): 355–375. Wells, David A. 1887a. “The Fall of Prices,” The Contemporary Review 52 (1 July): 523–548. Wells, David A. 1887b. “The Fall of Prices II,” The Contemporary Review 52 (1 July): 628–643. Wells, David A. 1887c. “The Great Depression of Trade I,” The Contemporary Review 52 (1 July): 295. Wells, David A. 1887d. “The Great Depression of Trade II,” The Contemporary Review 52 (1 July): 381. There are all sorts of discussion of this at the moment such as here, here, here, here, here and here. The libertarian commentary is attempting to deny that monetary policy had a significant role in the recovery of 1921. In response to this, it can be said, firstly, that the American banking and financial system did not collapse in 1920–1921, as in 1929–1933. Confidence in banks was, more or less, maintained. An important reason for this was undoubtedly the Federal Reserve banking system acting as a lender of last resort with its discounting policy in 1920 to an extent sufficient to avert a mass panic and bank runs, as argued by Wicker (1966: 223). Indeed, the evidence shows that the number of bills discounted by Federal Reserve banks soared until nearly the end of 1920. This fact alone is enough to damn the idea that the recovery from recession in 1921 was unaided by significant government intervention. Without a basic lender of last resort in 1920, admittedly following the classic guidelines of Bagehot to lend at a penalty rate to businesses in distress, it is unlikely recovery would have been so easy or rapid in 1921. To some extent too, the US economy was just lucky in 1920–1921: discount rate policy proved sufficient to avert banking collapse (instead of bailouts and much more radical intervention that was required in 1929–1933 but not done), the economy was not hit by the type of debt deflation (except perhaps to some extent amongst farmers) as it was in 1929–1933, nor were financial markets affected by the collapse of a massive debt-fuelled asset bubble as in 1929, nor were aggregate demand shocks as bad either. Even the price deflation was partly, and perhaps even significantly, the result of positive supply shocks after the end of WWI and the resumption of shipping, trade and production (Romer 1988: 110; Vernon 1991), not simply from severe aggregate demand shocks. 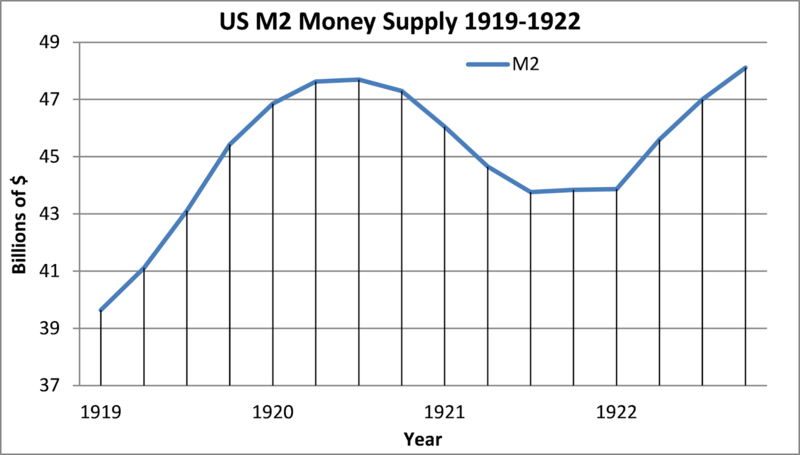 To return to monetary policy, while the broad US monetary aggregates M1 and M2 did fall in late 1920 and 1921, they clearly did not suffer a disastrous collapse to the same extent as money supply from 1929 to 1933. 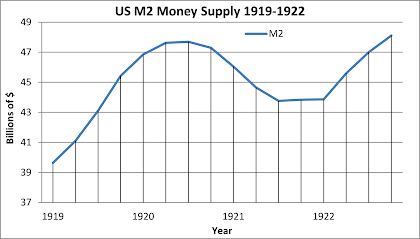 For example, the broad money supply as measured by M2 fell by about 6.37% from Q3 1920 to Q2 1921, but began growing again in Q3 1921, as can be seen in the graph below (with data from Balke and Gordon 1986: 803). In contrast, M2 contracted by an incredible 35.31% between 1929 and 1933, as credit contraction, bank runs and over 9,000 US bank failures (Wells 2004: 51) destroyed demand-deposit money and savings held by the public, while the 1920–1921 recession did not have such mass bank runs or liquidity crises in banks (Friedman and Schwartz 1963: 235), and even if some bank failures did occur one wonders whether the M2 monetary contraction was caused more by negative credit growth than by loss of deposits. The second element of US monetary policy in 1920–1921 was the discount rate as set by regional Federal Reserve banks. At the beginning of 1921 the discount rates of the Federal Reserve banks were either 6% or 7% (data in Discount Rates of the Federal Reserve Banks 1914–1921, 1922). In May a number of regional Federal Reserve banks began lowering discount rates from 7% to 6.5%. Then in July a number of rates were cut from 6% to 5.5%, and to 4.5% to 5% by the end of the year. The recovery from the recession is usually dated to July 1921, so that discount rate cuts did indeed precede the recovery. The libertarians claim that these rate cuts did not necessarily create loose monetary policy or easy money, but most probably the rate cuts beginning in May 1921 had a great influence on the economy by way of expectations and business confidence – especially by helping to create confidence and expectations of continuing rate cuts and looser monetary policy in the future, as indeed did happen. Another point that seems to be ignored is that the Federal Reserve system embarked on a proto-form of quantitative easing from late 1921 in which the Federal Reserve banks bought government bonds from November 1921 to June 1922 and tripled such holdings from $193 million in October 1921 to $603 million by May 1922 – a fact even noted by Rothbard (2000: 133), who complained that, to the Federal Reserve officials, “[i]nflation seemed justified as a means of promoting recovery from the 1920–1921 slump, to increase production and relieve unemployment” (Rothbard 2000: 133). Strange how modern libertarians seem to have forgotten this. Balke, Nathan and Robert J. Gordon. 1986. “Appendix B Historical Data,” in Robert J. Gordon (ed. ), The American Business Cycle: Continuity and Change. University of Chicago Press, Chicago. 781–850. Friedman, Milton and Anna Jacobson Schwartz. 1963. A Monetary History of the United States, 1867–1960. Princeton University Press, Princeton. Rothbard, Murray N. 2000. America’s Great Depression (5th edn.). Ludwig von Mises Institute, Auburn, Alabama. Wicker, Elmus R. 1966. “A Reconsideration of Federal Reserve Policy during the 1920–1921 Depression,” The Journal of Economic History 26.2: 223–238.